Morgan James Publishing, 9781683508571, 132pp. Lies, Damned Lies and Statistics presents the Relative Performance Grading (RPG) system of statistical measures, which ends all arguments over how good college football teams are relative to one another. 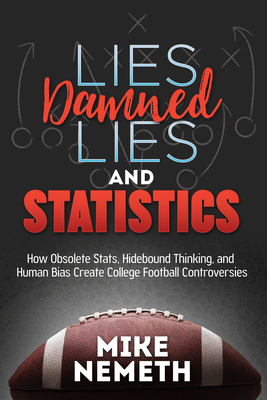 Using grammar school mathematics and a dash of ingenious reasoning, Mike Nemeth exposes the need for, and then invents, a new set of statistical measures to explain how and why one team wins and another loses a college football game. The new statistics assign a numerical grade to the playing performances of both winners and losers, just as a student receives a numerical grade on a school test. The grades in this RPG system replace won/lost records and differentiate well-played wins from ugly wins and well-played losses from ugly losses. RPG accurately ranks college football teams according to how well they've played the game, i.e. how good a team they are (and, NOT how good their record appears to be).